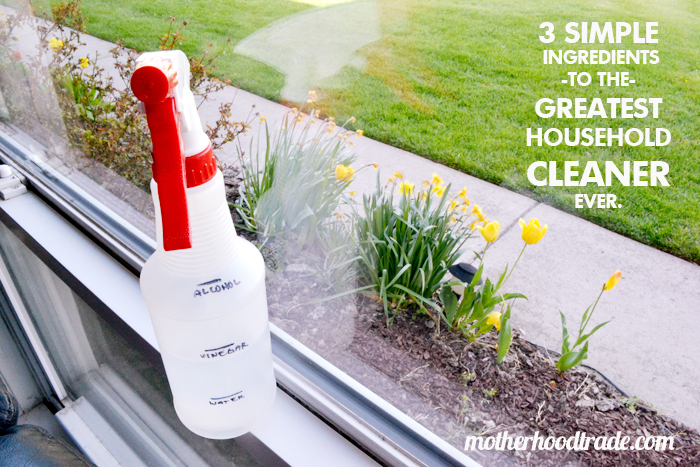 3 simple ingredients to the greatest household cleaner ever. Are you ready to ditch all your expensive chemically loaded household cleaners?? Once you try this cleaner you will. This all-purpose baby works wonders leaving your windows streak-free, your floors a shinin and clean, disinfects and wipes up counters beautifully and more! You just gotta try it to believe it! I was looking for a cleaner to clean my laminate wood floors and found this recipe on this site. And to my surprise I had all the ingredient to make it then and even more pleased with how beautifully clean it left not just my laminate wood floors but my kitchen floor. Sprayed and cleaned up my counters in a flash and the most miraculous part is that it even left my mirror and windows completely streak-free and sparkling!! I was sold. That was 5 months ago and I’ve basically only used this cleaner ever since. Mix in a spray bottle and spray use as you would windex on windows, and spray floor cleaners on floors (watch out for real hard wood floors as it might be too acidic for the finish) and all purpose cleaners on counters. As always with any new cleaner, find a spot to test to make sure it doesn’t do somethin’ crazy to a particular finish. For my floors, I sweep up first, spray and use a mircofiber mop to clean it up. I will warn you the odor is a bit strong at first but completely dissipates after several minutes. If you want an extra boost of yummy smell that lasts a bit longer, try adding drops of essential oils. I like to use a couple drops of orange and lavendar…smells cleeeean to me. I marked my spray bottle where each amount of water, vinegar and rubbing alcohol go so I can quickly fill it up when I run out. What are the ingredients doing?? Rubbing alcohol evaporates quickly helping to achieve a sparkling streak-free finish. The alcohol also breaks down oils, dirt and grime as well as disinfects. Vinegar is a powerful all-purpose cleaner. It’s levels of acidy break down grease and elminates most bateria and mold. Dish soap is added to help water and oils mix so that greasy gunk can be removed while rinsing with water. Don’t add to much as it will sud and overpower the mixture.